Last night, Aneel Bhusri, Jeff Weiner and I got to introduce Reid Hoffman for an award called the Innovation Catalyst Award here in Silicon Valley. We each spent about 10 minutes talking about our experiences with Reid over the years — always a fun thing to talk about, since he’s such an interesting, smart & good-hearted person. Was interesting, too, that even thought the 3 of us hadn’t coordinated at all in preparing our talks, they all came back to the same themes of his humanity, intelligence, and great desire to help good people be better. Reid is just a very consistent guy — he brings it every day. Best line of the night was Aneel’s: “Reid is kind of like the Kevin Bacon of Silicon Valley.” Good stuff. It’s a funny task for me to introduce Reid to all of you since he’s so well known. In fact, I’d wager that not only does everyone here know all about Reid already, but you’ve already had a lunch or a coffee with him at some point. His public accomplishments over the last decade are extremely well chronicled — I don’t think I need to mention the fact that he changed the world at PayPal. Or started LinkedIn, changing the way we all do work in fundamental ways. Or that he was an early angel in Flickr, Zynga, Facebook and virtually every other massively successful company that’s come out of Silicon Valley over the last 10 years. But most of that stuff is well known by everyone here, so instead tonight I’m going to focus on the human scale, and some of the ways that Reid has powerfully and meaningfully changed my life and the lives of so many people around him — I think that might work better to give everyone a sense of how he thinks, and why it’s so important. The thread that will tie all of this together is that 2 questions dominate the way that Reid thinks and interacts. The first one is this: “How can I change the world?” But really, every good entrepreneur asks that question all the time. Reid is unusually good at answering this particular question in a variety of different ways, but if that was the only thing he focused on, he’d be a great entrepreneur, but something less than he’s actually become. I’ve heard him ask it in board meetings, in pitch meetings, at the airport, over drinks — everywhere you can imagine. And in my mind, it’s the pervasiveness of that simple question — “How can I help?” — that sets Reid apart, and I’ll expand a little on that now. My own working relationship with Reid started off innocently enough while he was still at PayPal. I got an e-mail from an old friend Sean White who I literally hadn’t heard from in 10 years. The mail went something like this: “Reid, John: I think you guys might like each other; hope you can connect; I think it’ll be worth your time.” It’s maybe a measure of my cluelessness at the time, or of just how incredible a decade Reid has had since, but I didn’t know who he was, and he seemed only semi-relevant — a finance guy! from PayPal! but I trusted my friend Sean, so gave it a try. Sean was right, of course; Reid and I hit it off immediately, starting with a breakfast at Hobee’s that would begin a strong pattern for us. He was at PayPal, I was at my own startup Reactivity then; we just got together and, predictably enough, started talking about who we knew in common. We spent a lot of time in those pre-LinkedIn days — like we still do, really, asking questions of each other like “Have you met X? What do you think?” Or “do you know about company Y? Important?” And: “Who else do you think I should get to know?” That’s Reid, always, always, always building networks, always trying to put people together, see if they might fit. Over time we started working on various projects together, including Mozilla, and we’d each have lists of things to talk about going into each breakfast. The really remarkable thing about these interactions is that no matter how long we talked, no matter how much of our lists we would work through, we invariably left the meal with longer lists than we entered with — with more things to talk about, covering more shared areas of interst. And really it’s gone on like that since — another Reid characteristic for you: he’s always looking for more ways to help. The other thing that was obvious about Reid at that point is that he always had a plan, and he pretty much did what he said he was going to do. He was really clear when the PayPal acquisition happened that he would be on to his next thing, whatever it was, soon. I figured he would take a bit of time off, catch his breath. I didn’t know Reid well enough then, obviously — he quickly moved on, figured out that helping other people build work networks was what he wanted his attention to be on. So he got started. The conversation around LinkedIn was funny — obviously LinkedIn was the ideal startup for someone who thinks in terms of people networks like Reid does — in a lot of ways it’s the exact manifestation of his brain. But he was off to the races with LinkedIn, and around the same time I was trying to figure out what to do myself, having left my own startup a few months previously. And like he’s helped so many others figure out their path, he was extrordinarily helpful with figuring out mine. In 2005 I had sort of stumbled onto an unusual organization — a non-profit, and open source project — called Mozilla — it was just15 or so employees, but they had just released Firefox a few months before, and it held great promise — it was really starting to catch on. Reid & I both saw the promise right away, but as I thought about joining it, I was on the fence. Typically, he thought we should discuss it more with someone he knew — in this case Joi Ito, now Director of MIT’s Media Lab. He said “Joi’s going to be in town for about 90 minutes, so we need to meet him at SFO.” I made fun of him a lot for having airport meetings — now of course, the joke is on me, since I schedule them, too. So we met at SFO and had a conversation that, again, was typical of Reid & Joi, and went something like this: “do you think Mozilla is a place from which we can change the world a bunch for the better?” “Seems like it.” “Well, seems like we should all lean in then!” That’s another very Reid phrase: “lean in” — it means we should figure out how to do something meaningful. Reid likes to think about Archimedian levers — how to change the world the most with the most efficiency — and when he finds good spots to put the lever, he’s generally all in. So from that meeting, we each leaned in — Joi would eventually join the Foundation’s board of directors, Reid would join the Corporation’s board of directors, and I joined in an operating capacity. So for me, and for Mozilla, Reid’s orientation around finding ways to change the world, and to help others do the same, whether as entrepreneurs or social entrepreneurs or any other way — well, his point of view changed everything for us. And then I got to know Reid over the next several years as a board member, which is another great privilege, although a bit of a quirky one. Reid has a tendency to be extra outfitted in terms of his information technology. He’ll typically carry around 2 laptops and somewhere between 3 and 5 smart phones. So when he would come for a board meeting, lots of times he would bring out various of his devices and work away — enough so that you might start to think he wasn’t paying attention. But he is. Invariably during our board meetings, we’d be cruising along, Reid would be typing something or other then he’d pause, look up, and say something like “Really? That doesn’t make sense to me. Wouldn’t it really be more like this other way?” He had a funny way of completely changing the flow of the meeting, of causing us to re-focus on the most strategic items again and again — as usual with Reid, it was him searching for the best leverage possible. The funniest things were always when you talked about recruiting in a board meeting, though — every time I got back to my desk after discussing an open position at Mozilla, I’d have between 10 and 20 LinkedIn profiles waiting in my e-mail, suggestions from Reid on who to talk with next. His output is amazing that way. Even when dealing with a million other competing priorities, he’s as productive as anyone I’ve ever met. I talk about these very personal experiences because they’re the ones that I know the best, but, really, you could ask just about any current entrepreneur in Silicon Valley how Reid’s helped — he’s always got suggestions, connections, questions, tweaks to your thinking. Or DJ Patil, Greylock’s Data Scientist in Residence, who previously built the LinkedIn data team tells the story about how he went to introduce himself to Reid in a parking lot at UC Santa Cruz, whereupon Reid responded “Yes, I know who you are, we need to have lunch.” Their first lunch after that was 3 hours long. Overall though, here’s the thing: I haven’t met a single person in more than 20 years in Silicon Valley who’s more generous with their contacts or time, who’s more willing to listen and learn and brainstorm, or who genuinely wants everyone he meets to become as good an entrepreneur (in their work and in their own lives) as they can possibly be. His fingerprints are all over today’s business and technology landscape, and increasingly our social landscape. He’s got some of the flashiest credentials of anyone in the industry, but it’s hard for me to think of a more honest, self-effacing person to meet with. He’s busier than anyone I’ve ever met, but he will always make time to meet with young entrepreneurs. He’s smarter and more knowledgable about how the consumer Internet works than just about anyone, but leaves every meeting thinking about what he’s learned that’s new, where his old models don’t fit. And the guy barely has time to read a book, let alone write one, but that’s exactly what he’s done this year. The focus? Helping everyone become an entrepreneur in their own life, naturally. So in a lot of ways he’s a bundle of competing priorities and tensions. As Nancy Lublin puts it, “He’s the best example I know of good guys finishing first,” and so I’m very humbled to be introducing my partner and my friend Reid Hoffman tonight. Earlier this week I got to spend some time with one of my favorite professors and thinkers, Bob Sutton, in one of his classes at Stanford. I’ve given talks over the years for his classes, but for this one we decided to mix things up, and so he & I just had a conversation. He had a few questions prepared, but, honestly, we have so many shared interests in how to manage people and organizations that it took a first starter question for us to riff on a bit — and that generated plenty of questions from the class for the rest of the hour. 2 questions stood out to me that I thought were worth writing about some. The first was this: how do you motivate people? I had to think about this for a bit, because my answer is sort of a cheat: it seems to me that it’s too hard to motivate people who aren’t. So what you need to do is to hire incredibly motivated people, take them off the leash, and help them be great. Now, I think hiring great people is definitely hard — but finding motivated people isn’t really as hard as it sounds. My strong, strong belief is that most people really, really want to be good at what they want to do. In life, in work, in sport, whatever. People want to be good. Mostly people are willing to put in work to become good. So in my experience the art of getting motivated output is just helping people understand what good is and how to get from here to there. If you show them and help them get there, the motivation usually takes care of itself. The other interesting question is something like: why do people think you’re a good leader? This one I had to think through some — because I think there are a lot of details that maybe aren’t the core reason. But I think the core, long lasting reason is that most people I’ve worked with over the last 20 years or so know that I really want to help them win, to help them be good themselves. And that’s helped develop some amazing relationships with coworkers. I think that’s one of the secrets. I always want to follow people who can help me become amazing and who want to help me win, and I think that’s what people have seen in my own management over the years. It’s the decisive factor in my choices I’ve made over the years, including coming to Greylock. So I guess that’s the core of my management philosophy: we’re lucky to work in an industry where people are generally very talented, and want to be good — they want to make a difference and change the world — so mostly good management is about helping them see how, and helping them get there. 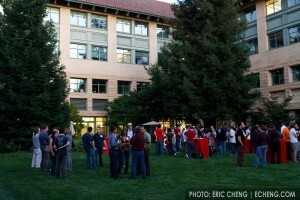 Anyway, a few weeks back I was lucky to attend HCI:20 at Stanford, a celebration of the 20th anniversary of the Human-Computer Interaction program at Stanford, started by Terry Winograd. There were a bunch of themes that I found noteworthy, and it was great to reflect on the origins and history of the program. And it was really fantastic to hear colleagues and friends of Professor Winograd talk about his contributions and impact over many years. One of the first speakers talked about a paper Winograd published in January 1971 — coincidentally the month I was born. It was an AI paper on some work he was doing at the AI Lab at MIT — really focused on computers understanding human language. And that was Terry’s focus for quite a long while, doing work with Flores on computers and cognition. It’s amazing to think about that — that so much of the modern discipline of HCI and interaction design grew up from roots in getting computers to understand and communicate in natural language. It makes total sense, of course — that the same people who were trying to figure out how to get computers to understand how to interact with us are the people now trying to build more effective interfaces — the interfaces have just changed. So you see a journey from language/AI through philosophy & psychology and on to design thinking — in my view, that’s when things really started taking off. The foundations in linguistics and computation (not to mention ethics) were extremely important, but it was when iteration and design thinking got into the mix that the field really started gaining momentum and influence. I started my own interest in HCI in about 1991, when the work was just starting to be oriented around design thinking (Bill Verplank from PARC, IDEO and Interval) and anthropology. The program had just started; I was probably a sophomore or junior at the time, and a senior friend of mine named Sean White kept telling me that I should look into it, that I would like it a lot. I kept brushing him off — I thought my path was going to be in (what I thought was the significantly more technical and higher impact world of) computer architecture design (RISC is the future!). That single question, quite literally, changed my life. I finally started to understand what Sean White had been saying all along, and started looking seriously into pursing HCI at Stanford. The second pivotal moment for me came shortly after, when I read an essay by Mitch Kapor making the case for software design as a profession. After that series of events, I was pretty well hooked, and dove into learning everything I could about how to design systems that people actually wanted to use; software that made people’s lives better. I started working on my master’s degree at Stanford with Professor Winograd as my advisor. There were only 2 courses in the curriculum at the time: CS247A, something like fundamentals of HCI, taught by Bill Verplank, and CS247B, something like using anthropological techniques to do needfinding, taught by someone who I remembered liking a LOT, but who I can’t recall anymore. At that point, I became the Annoying Junior Design Guy, quoting a (complaining) Don Norman all the time, asking everyone why the clocks on their VCRs and microwaves were always blinking “12:00” and generally just bitching about how badly designed the world was. I’m sure I was a real treat to be around. But then I got involved in a few more classes that I just really loved. I remember taking a class on Filmcraft in User Interface Design that pretty much blew my mind. The instructors of that class were Chuck Clanton and Emilie Young from First Person, a Sun spinout building a set top box that would fail, but would ultimately be the foundations of the Java programming language. They were really pioneers in thinking about how to use animation in computer interfaces — very early forerunners of the physics in the UI of today’s iPhones. Many foundational elements were put in place by Professor Winograd and friends in the early nineties — but I think that maybe the most important was getting the IDEO folks, and David Kelley in particular, involved. It brought a human-centeredness to the work that we did and that Stanford taught, and a religion around iteration that has served the program well since, and paved the way for a lot of what the Stanford d.School is today. Winograd did all this stuff at a time when, especially among “proper” computer scientists it wasn’t very fashionable — but he had conviction and passion around the work — and of course he was right to. From the vantage point of 2011, it’s clear that the work done by Winograd and the rest of the growing HCI group there is important and has had a large impact on creating thoughtful designers. It’s also very, very clear that our educational system hasn’t produced nearly enough good designers who are technical enough and talented enough to build all the great products and companies that Silicon Valley (and the world) are trying to build. That’s not particularly an indictment of the educational system — we’re in a golden age of technology development — a sort of New Cambrian Age of personal digital life. There are so many new things to build, so many new areas of communication to explore and create, so many new interactions to create from whole cloth — as a society and as an industry, we’re going to have an insatiable appetite for great designers certainly for the coming decades. We’re in a time now when everything’s changing; everything is up for grabs. I’m just incredibly glad that Professor Winograd and his colleagues had the foresight to set the foundations that we’re building on so quickly today. And personally grateful for Sean White pushing me to notice the things that were happening right under my nose. Last week I got to attend a class at Stanford Business School taught by one of my favorites, Huggy Rao. The course is on “scaling” — an over-used word, but one that Huggy’s been really digging into lately — resulting in some great insights. This particular class covered a case study authored by Huggy with Bob Sutton on the rise of Mozilla and Firefox, so it was fun to participate in. Huggy asked me to do a quick 10 minute introduction to the class. I chose to talk about the differences between then and now — how much has changed in the 5.5 years since Firefox’s initial 1.0, and what the new challenges of scaling are. So, naturally, my first comment to the students was that most of the case was irrelevant to today’s world. That Mozilla was amazing and unique and special — for lots of reasons that include (1) breaking the MS/IE monopoly distribution and usage of the browser, (2) doing it in a way that enabled lots of innovation and competition that we’re seeing now, and (3) finding our own way through the journey — not behaving like anyone else in the market ever really has. So that’s cool. In that battle, though, access to users was probably the biggest challenge — it looked impossible when Mozilla started, and it’s remarkable — incredible, really — that we ultimately have gotten the reach we have. So now a huge part of the world is accessible, a huge part of the world is ready and able to download an app or click on a shared link. Which means that access is no longer the chief initial obstacle to scaling. That means you can see companies like Zynga or Groupon rise from nothing to massive practically overnight. Clearly, the initial challenge is about rising above the noise of an increasingly crowded field of ways for people to spend their time and money, but it’s very, very possible to get to tens or hundreds of millions of users quickly. Which means that now you’ve got companies that are dealing with huge, complex, global user bases at an extremely early point in their history. My view is that scaling successfully — which means sustaining that scale over time — will be dependent on figuring out how to make the teams and processes in rocket ship organizations operate effectively. I know not all the analogies in the slides are apples-to-apples, but what’s clear is that we’re living in an era of hyper-distribution, where things can change very, very quickly. I’m really glad that smart people like Huggy and Bob are thinking about how to help us all learn how to manage these in the future. View more presentations from John Lilly. I’ve made countless decisions in my career since first arriving at Stanford in 1989, but one of the top 5 specific decisions that I’ve made was to become a section leader for introductory Computer Science classes at Stanford my sophomore year. I literally can’t think of a single choice that’s had farther reaching implications in my career. Some background is in order, I think. The introductory CS classes at Stanford are called CS106A, CS106B, and CS106X — they’re taught by lecturers (who, in my experience, were far & away the most committed, thoughtful, caring, accessible, and, ultimately, impactful teachers at Stanford) and the class size was often large, anywhere from about 50 students up to 300 or so. The lecturers were supported by one TA, and a staff of “section leaders” — each an undergrad who was responsible for 6-10 students, would lead a weekly section, grade programs and generally give close attention to their group. In any given quarter, there would be about 50 of these section leaders, as well as 2 “CS198 Coordinators” — these 2 were generally grad students, and they selected and hired new section leaders through an interview process and also taught a 1 quarter class on how to teach. It’s a great program, with a fantastic focus on peer teaching, and I think resulted in great results not only for the students taking the 106 courses, but also for the section leaders themselves. I was turned down the first time I applied to be a section leader, but wanted to do it badly enough that I applied a 2nd time and was accepted. And eventually I was turned down twice when I applied to be coordinator, being accepted the third time around as a grad student. And that was probably my best experience at Stanford — well worth the feeling of getting turned down the first two times. I think we knew, even then, that the program was incredible — that it selected amazing people and helped them develop in amazing ways — helped them learn CS at a deeper level, of course, but it was also shockingly effective at helping us all learn to teach and communicate — to really balance out the technical aspects of our education. It’s only with the benefit of hindsight that we can really see how incredible the program has been. The reason I’m writing about it now is that a few weeks ago we had the first ever reunion in the 40 year history of the program, and it was just awesome. (You can read Eric’s blog post and see his pics, too.) The make up of the attendees was a bit like a who’s who list of Silicon Valley: startup founders, new CS professors, VPs of Facebook, Google, LinkedIn, CEOs, VCs, chief architects, researchers, and many others. The density and scope of achievement is really hard to describe, honestly. This program has had as much impact on Silicon Valley as any single program that I know of. More personally, it reminded me of how many lasting, close friends that I developed there — most of my best friends went through the program at some point, and it was so good to see so many of them together. I trust we won’t wait another 40 years to have the 2nd reunion of the program — I’m looking forward to having another one, soon.